Avocado salads are quick and easy to make and will keep you full for longer. This vegan salad is made with cannellini beans, tomatoes and fresh herbs. Great for lunch or a light supper. Each serving provides 727 kcal, 23g protein, 51g carbohydrates (of which 8g sugars), 42g fat (of which 8g saturates), 28g fibre and 1g salt. Soak the onion in a small bowl of cold water for 5 minutes to remove some of the heat. 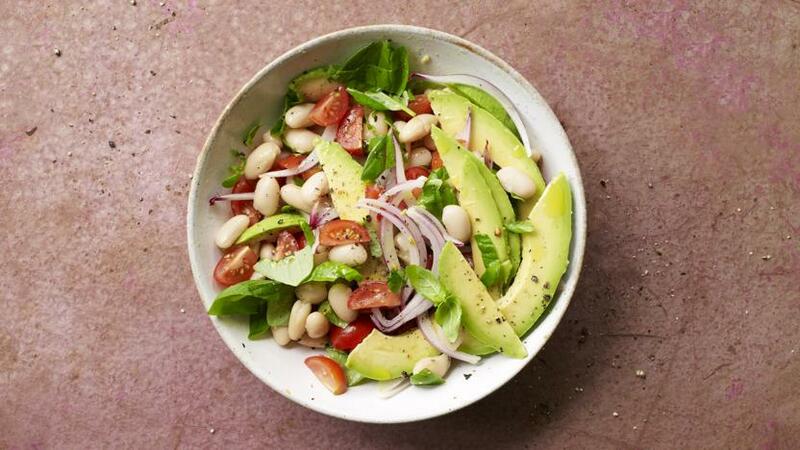 Toss the cannellini beans, avocado, cherry tomatoes and basil together in a bowl. Drain the onion and pat dry with kitchen paper then mix into the salad. Drizzle over the lemon juice and oil, season with salt and pepper and serve. Cannellini beans are easy to get hold of, but this salad would also work with any white bean, such as haricot or chickpeas. When they’re in season, chopping a couple of big, red tomatoes would be a lot cheaper than cherry tomatoes, but outside the summer months they’re the sweetest tomatoes you can buy. If you don't have fresh basil, coriander would also work.